The tickets have arrived, the tent’s been hauled down from the loft and excitement levels are sky high. Yes, it’s nearly time for Camp Bestival. And we can’t wait. Let’s start at the very beginning. What should you pack? It’s easy to go overboard at this stage. As parents, it’s usual to pack for every eventuality, but, remember, unless you’re in the campervan field, you are going to have to manually haul all that stuff from the car park to your pitch/tent, so keep it light. That’s not to say that you can’t camp in luxury. Let’s do a quick checklist. Tent. Bells are super-easy and quick to put up, but offer open-plan living, so you need to all get on! They are also heavy – you’ll need to bring or hire a trolley to transport it – and you have to make sure they are bone dry before packing them away, which can be problematic. They do, however, avoid all those arguments about how long it’s taking to get it pitched as it’s all done in 15 minutes, plus there’s no more hunched over, sweaty scrabbling around under nylon – bells are light, airy, cool, spacious and fabulous. We have a 5m-ZIG from CanvasCamp and it’s ample for a family of four (and their multitudinous soft toys). A multi-room version might be a better option if you have kids of wildly differing ages/interests who are likely to keep each other awake/drive each other mad. Don’t forget a mallet (although borrowing, or lending, one is a good way to make friends with your neighbours). You may, of course, have opted for boutique camping, in which case, sit back in your Podpad, bedouin tent, tipi, yurt or gypsy caravan, relax and watch people struggling with guy ropes or rowing over who forgot the tent pegs. Trolley/wagon/pushchair. You’re going to need to transport all your gear from the car park to your pitch. To avoid back injuries/severe grumpiness, wheels are the way to go and, unless your pushchair is the baby equivalent of a Landrover (this is hilly, bumpy terrain), a wagon or trolley is essential. Radio Flyers are brilliant and virtually indestructible – our Big Red has seen a lot of action and is still going strong. There are lots of alternatives on the market, but I’d recommend getting something big enough for your little ones to snuggle up in. You’ll be thanking me when you get to see Orbital’s entire set while they snooze. For babies, consider bringing a sling or back carrier instead of a buggy. Now that our children are bigger, we’ve traded in the Radio Flyer for an Outwell Maya Transporter. It’s an absolutely brilliant bit of gear – it folds up, making it a breeze to squeeze in an already overloaded car, large enough to fit two children in (has been declared ‘really comfy’ by my two), easy to manoeuvre and comes with a cover to keep your stuff dry in case of rain – although, of course, that never happens at UK festies… It also has a nifty carrier for a matching cool bag at the back, so your children won’t be constantly complaining that they don’t have enough room/have something poking into their back. It’s sturdy, too – ours made light work of last year’s slightly boggy environment. The disadvantage of bringing your own wagon is that they take up a lot of space in the car, which may already be fit to burst. It’s easy enough to acquaint yourself with Mr Trolley, where you can hire heavy duty trolleys for £5 per half hour (plus a £50 cash deposit). They also offer pre-booking for overnight hire - £40 for a basic trolley or £70 for a padded one with a canopy and you can pick up from one of four hire points (Yellow car park 3 for main camping, Green car park 2 for Camping Plus, Yellow car park 1 for Boutique camping and White car park 1 for Backstage VIP/Accessibility/Hospitality) from 6pm on Friday. Inflatable mattresses. As far as I’m concerned, these are a must. We have a Coleman Maxi Comfort Raised King, which is basically like having a normal bed to sleep on – sooooo comfortable. This year, we’ve added Bundle Beds to our camping arsenal – total game changers (read about them here), so no more need for mattresses and sleeping bags for the children, but we highly recommend these awesome sleeping bags from Outwell that come with kid-friendly features like a toy pouch, a rainbow-coloured zip that has a carabiner with a mini torch attached and a brilliant carry bag with handles and a zipped pocket for treasures.Think light and portable and remember a battery-operated pump unless you want to be wheezing your way through the first night. You can get chilly quickly when you’re camping, especially if you’re little, so pack as many blankets as you think you might need, then squeeze in a couple more. Coolbox. A good cool box proves invaluable at a festival. Especially a cool box on wheels… You may be thinking of taking advantage of CB’s many fantastic culinary options, but you never know when you might unexpectedly find yourself back at camp with a hungry/thirsty child or in need of a restorative cup of tea. We tend to eat breakfast at camp and sometimes return to cook tea and get changed before venturing out for the evening, so we also take a lightweight Pack-Away Table, which features two padded benches that fold to fit inside. You can never take too many snacks to a festival. You’ll find that the children are permanently hungry and if you’re buying snacks every time it’ll cost you a fortune, although ice lollies/ice cream, churros, chips and corn-on-the-cobs are a given! I’ll be talking more about festival eating and drinking later. Water bottles. We’ve tried lots of different water bottles, with varying degrees of success and leakage, and have settled on Chilly’s bottles, which have the added benefit of keeping drinks cool. They seem pricey initially, but when you think of all the money you’ll save on bottled water (plus the lack of plastic waste), it’s a good investment. Weather wear. Sunny or rainy, warm or cold, the weather is rarely a problem if you’re well prepared. That means sunscreen, sunglasses, sandals, sun hats (plus UV suits/rash vests for the littlest ones) and wellies, macs, fleeces and hats all need to be packed. Try Muddy Puddles for kids’ wet weather gear – their Puddlepac pac-a-macs are brilliant and kept us dry last year – while Little Hotdog Watson is the place to go for funky, UPF50+, mosquito repelling sunhats. And, just in case of rain, or overtired children in need of tent time, colouring books, pens and a couple of games are a good idea – Monopoly Deal, Top Trumps and Uno are our go-tos. Illumination. You’ll be surprised how dark it can get even when you’re camping with tens of thousands of people. Take torches and lanterns – the Coleman Micro Quad looks like a good buy for families, comprising four detachable LED lights – for those middle-of-the-night toilet trips. We also bought these fab solar-powered LED lanterns from Ikea and they made the tent feel really homely. Battery or solar-powered fairy lights are handy for pimping your wagon at night and are widely available in supermarkets or stores like Flying Tiger. Loo. I’ve been to many festivals and I can honestly say that Camp Bestival’s are the cleanest and most well-stocked I’ve experienced. Of course, that doesn’t mean to say your just-out-of-nappies little one is going to feel the same, particularly in the dark, so I’d recommend taking a potty or bucket (or a bucket with a Potette seat) for the aforementioned late-night toilet trips with toddlers. Do pack loo roll, anti-bacterial hand gel/spray and biodegradable wet wipes (but don’t put these in the compost loos). For the showers, take a travel towel that will dry quickly and flip flops or a small roll-up bath mat. Safety. Ear defenders are essential for children at festivals – even if you’re not thinking of venturing down to the front of the main stage, they’ll come in handy if your children want to sleep in the evening while you enjoy the entertainment on offer. Children’s ear defenders (we have Muffys from Alpine Hearing Protection, but Peltor Kids, Baby Banz and Edz Kidz are all good and widely available). They do block out a lot of noise, so be prepared for your child to ignore you asking them to do stuff more than usual! We always take a first aid kit (just in case), although, fortunately, we have rarely needed anything more than a plaster and there are always medics on site in case of emergencies. LittleLife’s Family First Aid Kit, is pretty comprehensive and even contains star stickers to be awarded for being brave. 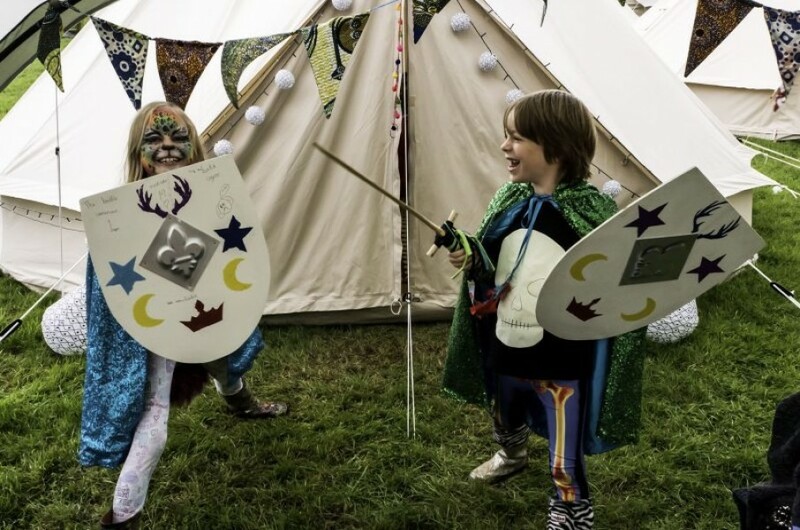 Losing sight of your child at a festival is every parent’s worst nightmare, and although Camp Bestival provides Tyvek wristbands to write your number on, many children don’t like the feeling of them, so it’s a good idea to have a backup as well. Kattoo tattoos are a simple solution, and we have Bambino Goodies lost children badges, because what child doesn’t love a badge? Pin one to every layer of your small person’s clothing. A wrist link or toddler rucksack with rein is also a good idea for potential mini Houdinis. Lots of people put glowsticks on their children at night, so they’re easier to see, but we’re trying to avoid plastic waste, so I’ve bought USB rechargeable LED wristbands that we’ll hopefully be able to reuse every year (if they don’t get lost of course). Mini torches on a lanyard would also work well as a more eco alternative. If you have a young baby I’d recommend taking a pop-up sun tent as there’s not much shade in some of the areas – I found ours invaluable when I took Kitty at five weeks old. Fancy dress. An absolute essential. First timers often think they’ll feel foolish, but at Camp Bestival you’re more likely to feel foolish if you don’t. This year’s theme is Camp Bestival Sets Sail, so there’s plenty of scope there. Alfie’s current plan is to go as Poseidon (DIY trident, anyone?) and Kitty as a mermaid, while I’m concocting a plan for a jellyfish costume, but we also like to sport as many sparkly, shiny, fabulous accessories as possible for the rest of the weekend – it detracts from the dirt, after all! If you don’t have time to perfect your outfit there are plenty of options on site – the children’s dinosaur and leopard tails from the Tell Tails stall are worn over and over again, while NamNam’s face painting tent is an annual favourite. I recommend popping over to Spinney Hollow to make a flower crown to cover up festival hair, or just apply (biodegradable, natch!) glitter to greasy roots. Don’t bring… Glass (decant your gin into a plastic bottle before you leave), Chinese lanterns, fireworks, inflatable chairs or beanbags, family pets. There’s a full list of prohibited items here. 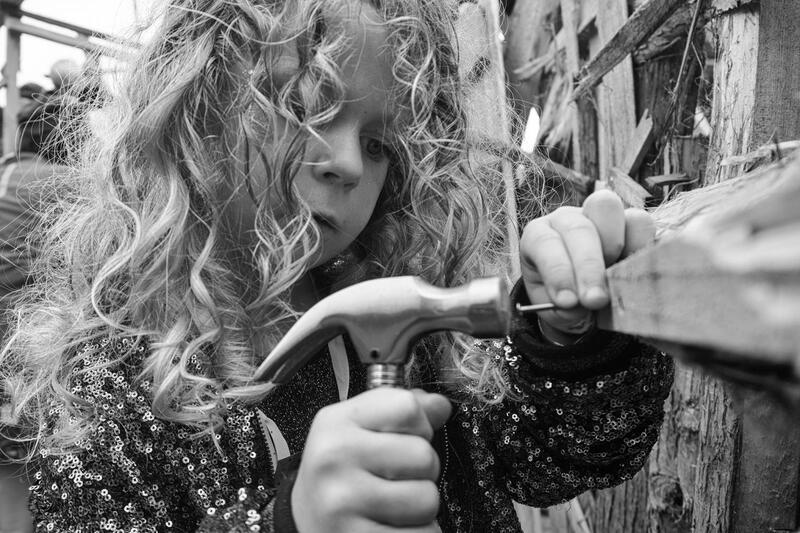 Stay tuned for Part 2 about the practicalities of camping with children at festivals, including where to pitch, keeping clean and how to get some sleep!